It can be difficult to determine whether you’re dealing with just a simple cough from a routine respiratory virus or if that cough is an early indication of a much bigger medical issue. Bronchitis occurs when there is an inflammation of the bronchial tubes, the airways that carry oxygen to the lungs. Over 10 million Americans are diagnosed with chronic bronchitis every year, 90% of which are smokers or individuals that have had a history of smoking. Besides smokers, occupational hazards such as air pollution, chemical fumes or large amounts of dust may put individuals at-risk. Unfortunately, there is no cure for chronic bronchitis – it’s a long-term condition that reoccurs and almost never goes away. This fact alone drives many individuals to lose hope and regrettably continue down the same path that led them to this scary place of respiratory disease. That is a huge mistake. 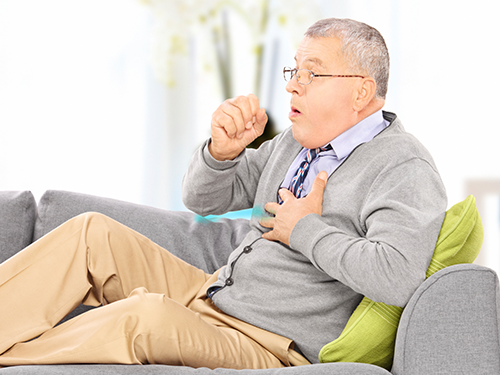 While there may not be a cure, there are several things those with chronic bronchitis can do daily to suppress their symptoms and hopefully move toward a life free of painful coughing and difficult breathing. Did you know that closely managing your dietary intake could decrease the severity of your symptoms? It’s widely recommended to balance your diet with low-fat proteins (lean cuts of meats, poultry, fish), complex carbohydrates (wheat bread, brown rice), fresh fruits and vegetables, as well as foods high in potassium. Any foods that may cause gas or bloating should be monitored very closely because repeated bouts of severe heartburn and throat agitation will make you more prone to developing bronchitis. Partaking in exercises that will stimulate heart health such as biking, walking, or swimming often help the lungs utilize oxygen more efficiently, which means less shortness of breath and deeper breathing. Yoga is another helpful activity that helps stimulate your lungs through focused breathing. As mentioned previously, there is no cure for chronic bronchitis, but managing one’s diet and maintaining an active lifestyle may help. Another option may be a research study in the Miami area. Clinical Trials of Florida is excited to be testing a potential new medication for chronic bronchitis and volunteers are needed! Those who participate in the study will receive free hands on care from board certified doctors as well as compensation for time and travel. 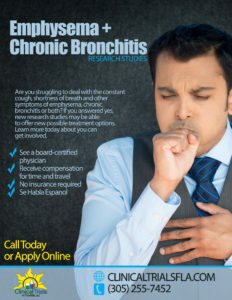 LEARN MORE ABOUT A RESEARCH OPPORTUNITY FOR THOSE WITH CHRONIC BRONCHITIS HERE!